A new special report from Microgrid Knowledge and NRG Energy explores the rise of local energy and what it means for businesses, institutions and communities. This excerpt introduces the benefits of microgrids and distributed energy. Distributed energy resources (DERs) represent a departure from the conventional electric grid because of their proximity to the customer and the way they function. To grasp DERs and their significance, it’s important to first understand the grid. In the U.S. an interconnected, centralized grid delivers electricity from about 7,300 power plants through 160,000 miles of high-voltage power lines and millions of low-voltage lines to about 145 million customers. Distributed energy sits at a different position on the grid — not at the center but along the edges close to customers. Common DERs are fossil fuel generators, solar, rooftop wind, combined heat and power (CHP), fuel cells, energy storage, microgrids and nanogrids. Most DERs in the U.S. are connected to the grid. They typically run when doing so is less expensive than buying power from the grid. DERs also provide power and services to the grid — in return for payment — when the economics warrant. These exchanges can occur because of advancements that allow DERs to do more than just generate power. With the addition of new software and controls, they have become tools that make energy management more versatile, flexible, reliable and cost-effective. Among DERs, microgrids are particularly important as they offer some of the greatest benefits, thus are increasingly an option for decision-makers. Microgrid operators set controls to accomplish goals desired by the customer, including lowest possible energy price, greatest system efficiency or reduced emissions. Equally important, the microgrid serves as a form of backup electricity. When a power outage occurs, it can “island” or disconnect from the grid and employ its on-site generators to ensure electricity flows to the host buildings. Microgrids can vary widely in size. A microgrid may generate enough power for a few homes or an entire community. Some begin small and later add more generation resources. Hence, a microgrid can easily scale to its host’s needs. A microgrid’s internal resources can vary tremendously as well. Some include only renewable energy; others contain traditional fuel generators; many are a combination. 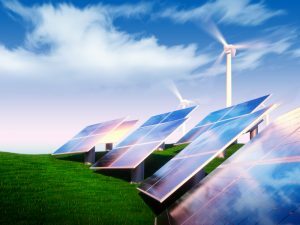 Common resources include natural gas and diesel generators, solar panels, wind turbines, fuel cells and even sometimes electric vehicles. Microgrids also increasingly include energy storage. A microgrid’s generation mix depends on a range of factors, including the host’s energy goals, operational parameters and accessibility of a particular fuel. Another consideration is the host’s need for thermal energy. Early microgrids, as well as many newer systems, use CHP if they require large amounts of heating or cooling. CHP uses the heat byproduct of electricity generation to produce steam, hot water or space heating or cooling for a practical purpose—to heat or cool a building or serve a manufacturing process. Because it uses one fuel source to produce two forms of energy, a CHP system is highly efficient. In addition to generation resources, a microgrid contains infrastructure such as wires, cables, switches, piping and transformers to distribute energy from source to host. Digital sensors and actuators imbue the system with data gathering and sharing capabilities, as well as real-time response and management abilities. Microgrid controllers — sometimes called the “brains of the microgrid”— manage and optimize its working software and DERs. By coupling algorithms and instructions embedded in software and communications systems, controllers sit at the intelligent core of a microgrid platform. Microgrid controllers manage the system’s generation resources, load requirements, frequency and voltage and connection to the central grid. These software-based devices balance generation and load and respond to any changing conditions. In an advanced microgrid, one master controller provides primary management, while several secondary controls serve specific functions. Controllers range in function and features depending on the project’s scale and scope, as well as the client’s budget, needs and expectations. The simplest microgrid controller may integrate a single, on-site source of power — a natural gas-fueled generator, for instance — and balance its output with internal load. Microgrid controller capabilities can get much more complex from there. Advanced controllers continuously monitor and balance on-site generation with internal loads and utility grid power. New, more intelligent, controllers integrate predictive analytics software. They can identify problems and issue instructions that prevent costly and hazardous system failures. Some include weather forecasting so operators are aware of available solar or wind power, or the coming of threatening storms, which gives them an opportunity to prepare, ensuring they have fuel supply and workers, should a power outage require that the microgrid island. The most sophisticated can forecast electricity and fuel pricing and optimize resource use. Based on their pricing analytics, they may choose to use grid power, internal resources or some combination of both at any given time. The following examples show where microgrid controllers realize benefits. The central grid is under strain or an outage has occurred; sensing a problem, the microgrid islands from the main grid and serves host buildings with internal generators. However, the on-site production is insufficient, so the controller begins “shedding load”— reducing electric consumption by switching off devices, equipment or entire buildings not crucial. Such shedding also may occur when prices are high as a way to save on cost. The controller may be programmed to maximize use of renewable energy, when it’s available. The microgrid may rely on solar panels during the day when sunlight is plentiful. It may even store some energy in batteries. Then, during evenings it will discharge the batteries. When the charge is spent, it may then turn on its natural gas generators. Electricity prices vary throughout the day and night. Some advanced microgrid controllers monitor price forecasts and choose the combination of resources—grid or internal—that offer the best price at any given time. Depending on the rules of the local grid operator, the microgrid might also sell power and services, such as system balancing, voltage and frequency control and spinning reserve, back to the grid. The microgrid also may participate in demand response—curtailing its use of grid power during periods of high demand—in return for compensation. In addition to intelligently managing energy, the controller helps realize another crucial microgrid benefit, the ability to supply highly reliable power as described next. What is demand response? Electricity customers participate in demand response by reducing their usage during peak periods. Customers may take a range of actions, from dimming lights to re-scheduling work shifts to relying on on-site generators. In return they receive financial compensation. 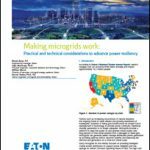 How does a microgrid ensure reliable power? Placing generation near the consumer enhances electric reliability, since there is less chance for the flow of electricity to be disrupted by a damaged wire along the path. But this technology goes a step further. The microgrid’s ability to island during a power outage is one of its hallmark features. In island mode the microgrid essentially operates autonomously and relies on internal generators to serve its host. As a cost-saving measure, a host may require only critical needs be met within its buildings; perhaps the emergency room of a hospital or freezers in a food processing plant. The microgrid serves the most important functions first and then works sequentially down a list of lesser priorities. Newer, advanced systems make the switch between grid and island mode seamless; those inside the buildings are unaware of this electricity shift. Given their ability to keep power flowing, it’s not surprising microgrid development is on the rise. Their importance grows as society becomes increasingly electricity dependent and power outages threaten safety. Economics also are spurring microgrid development. The cost of microgrid components has been dropping, opening the opportunity to more organizations. It’s clear why these organizations would install microgrids, considering the reliable power and sophisticated energy management they offer. But what forces brought the energy world to this point — and what else might customers expect as technology advance? We answer these questions in the next chapters.